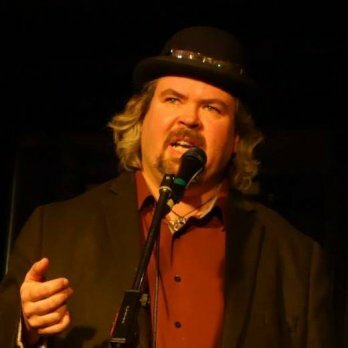 John David Hickey has been performing as a storyteller for over 20 years, telling tales in concerts, festivals, and story swap evenings. Dave is an engaging teller who makes good use of his acting experience to add a theatrical spin to his stories. His strong stage presence keeps his listeners on the edge of their seats as he weaves his tales of mystery, adventure, and laughter. He wears his love of a good story on his sleeve; you can see that he's enjoying telling you the story as much as you'll enjoy hearing it. He has told fables, folktales, and legends in various festivals and events in Quebec and Ontario, in both English and French. Visit Dave's website (www.johdavidhickey.ca) to listen to the stories and order a CD or download the MP3s. Listen to Dave's recordings by visiting his storyblog podcast called Shortening the Road at: shorteningtheroad.blogspot.com or download MP3's of his stories from CDBaby through his website (www.johdavidhickey.ca). John David Hickey tells to adult and young adult audiences and is willing to travel.